Kazan is the capital of the Republic of Tatarstan and the third capital of Russia, behind Moscow and St. Petersburg. It is also a fascinating mix of western and eastern cultures. 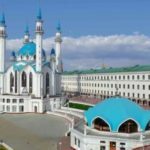 Within the Kazan Kremlin, only 100 meters separate the Kul Sharif Mosque, one of the largest in Europe, and the Cathedral of the Annunciation, a great Orthodox temple. Islam and Christianity coexist in this city, also called the Istanbul of the Volga, a city with which it is entwined. 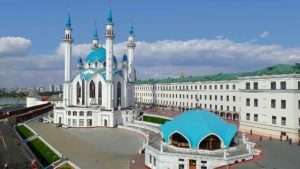 We must not lose sight of the fact that half of the population of the Republic of Tatarstan, whose capital is Kazan, is Muslim, while the rest are mostly Orthodox Christians, so it is not difficult to find groups of friends or couples that mix these and other religions.